What does 9-year-old Maggie want to be when she grows up? A data rockstar like her dad, Chris Jones, who is a Tableau enthusiast in his own right (and analytics specialist at ExxonMobil). We sat down with the budding analytics superstar—and her dad—to learn more about what inspires them to dig into the data. 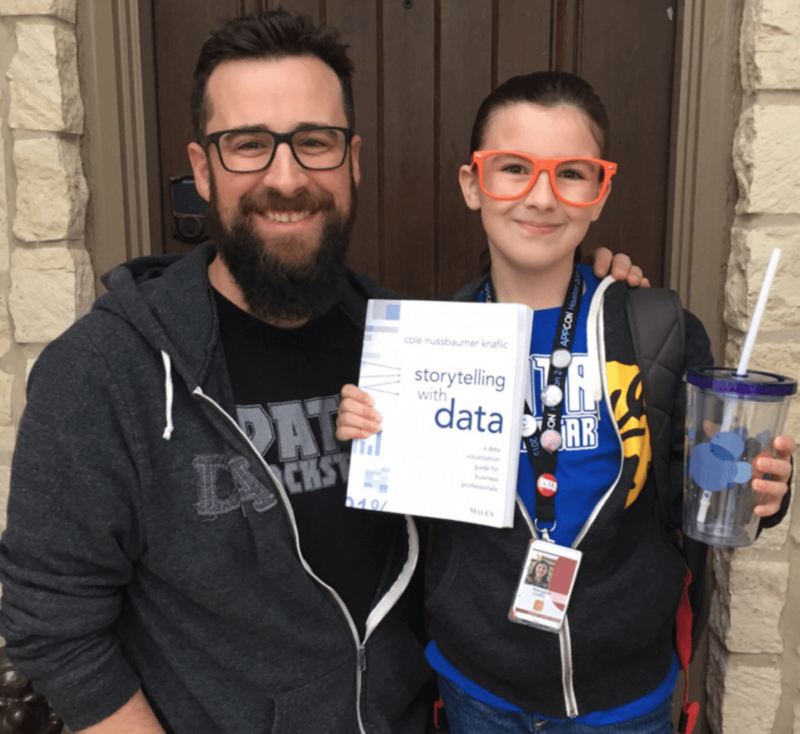 Maggie says, “I want to follow my dad’s path,” so it’s no surprise that she dressed as a “future data rockstar” for Career Day at school. And not only does Maggie have the attire of a data rockstar, but she has the skills to back it up. Her data journey began when Maggie was hanging out with her friend Alena. Alena’s dad is from East Germany, and Maggie found herself wondering: How many people in our hometown were born in Germany? What began as a simple curiosity stoked the flame for other data-driven questions. So, after Maggie discovered how many Germans live in her hometown (18, by the way), she got her hands on more data. To get Maggie started, Chris asked her what type of data she’d be interested in exploring. He showed her previous vizzes he’d built, like his Deadpool viz. This is the one that hooked her, though she had some feedback: “Why did you have to make a viz about a movie I can’t see? You should make one with kid-friendly movies.” So that’s what they did. 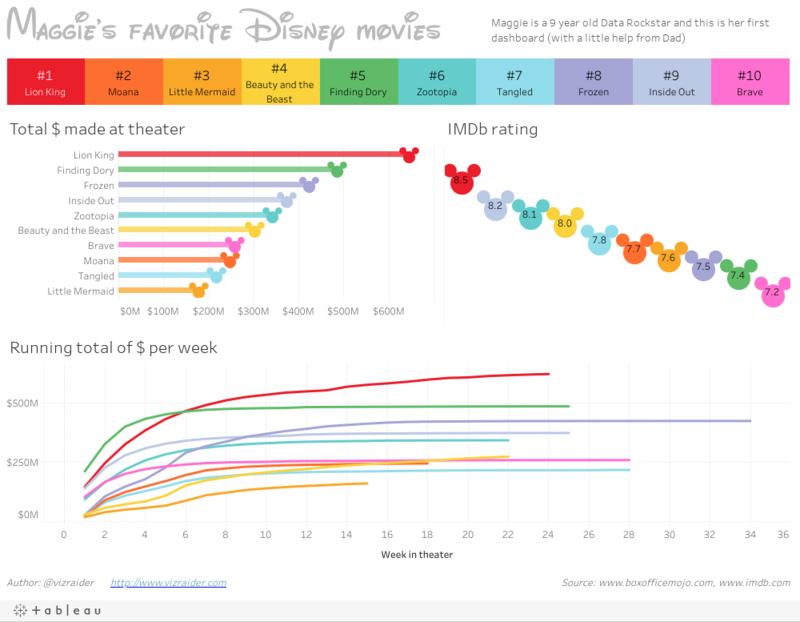 With some help from her dad, Maggie collected data to visualize her favorite animated Disney movies, which she ranked according to her favorite soundtracks. Chris buttressed her data set with stats from IMDb regarding film ratings and box office sales. After bringing the data into Tableau, Chris showed Maggie the interface—everything from dimensions and measures to line graphs. He started dragging and dropping to build views, and Maggie exclaimed, “Wow, that was cool!” when charts instantly appeared. Before long, Maggie took control of the mouse and keyboard. Chris prompted her with questions, and she’d use Tableau to answer them. When asked, “What if we want to make this chart a certain color?” Maggie promptly answered, “We drag it onto the color box.” She caught on quickly, and even discovered an insight about her favorite movie: The Lion King has the highest IMDb rating and box office sales of her favorite films. The dashboard, which includes her favorite animated movies (and features the Jewel Bright color palette with her favorite color “utopia”), was impressive. However, Maggie thought it was missing something. She wanted to move beyond using just bar charts, so Chris suggested a lollipop chart. With another analytics lesson in the books, they customized the lollipop chart with mickey mouse ears, added a few finishing touches (like Disney’s own font), and—just like that—Maggie created her first viz! In addition to updating her viz, Maggie’s already talking about a new project: a survey about class pets. We can’t wait to see your next viz, Maggie! Superfan Fact: Maggie just aced her data test in math, proving that she’s a true data rockstar. Data kids and parents, we invite you to join our Data Kids community group! Please sign up here to request access. great example of making self serve data fun!